The WW100 commemorations have drawn renewed attention to our First World War memorials. This does not mean our Second World War memorials should be forgotten: 13 December 2015 is the 75th anniversary of the unveiling of a unique and spectacular memorial at Achilles Point, overlooking the Waitematā Harbour and Hauraki Gulf. Ref: Bruce Ringer, HMS Achilles memorial, St Heliers, 2014. In December 1939 the New Zealand ship HMS Achilles played a leading part in the Battle of the River Plate, which ended with the scuttling of the German raider, the pocket battleship Graf Spee. 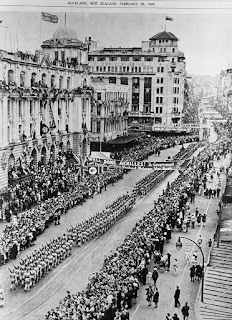 On 23 February 1940 the men from the Achilles paraded up Queen Street to a tumultuous welcome and a civic reception at the Auckland Town Hall. 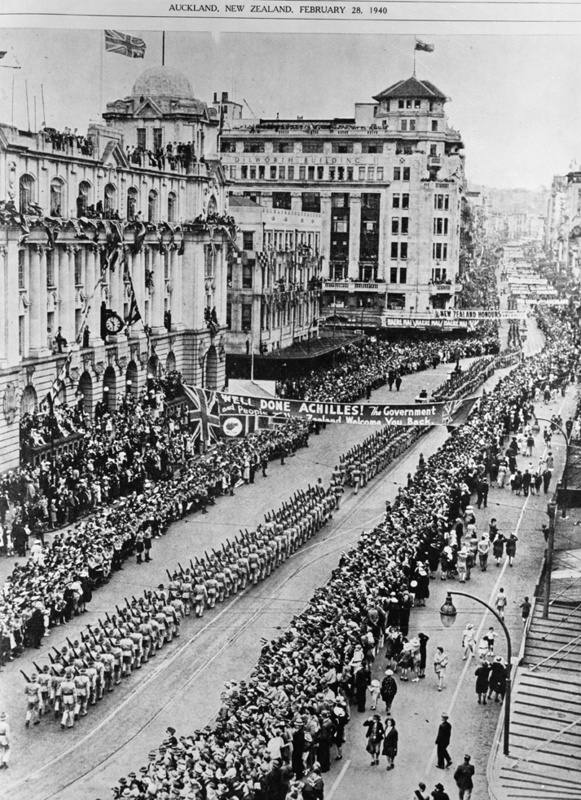 Ref: Auckland Weekly News, Men from HMS Achilles parading on Queen Street, 23 February 1940, Sir George Grey Special Collections, Auckland Libraries, A4389. Already, on 16 January 1940, Auckland City Council had resolved to name the tip of a headland on the western side of the Tāmaki River as Achilles Point. The headland itself had been known to the Tainui people as Te Pane o Horoiwi, but was commonly referred to as West Tāmaki Head. This reserve is dedicated to / commemorate the gallant performance of H.M.S. Achilles / and the bravery of her captain / officers and ship’s company / in the victorious naval battle / fought in the South Atlantic / off the River Plate / on December 13th 1939. Two memorial seats were later dedicated adjacent to the memorial: one donated by Private J.E. (Ted) Scherer in memory of a friend, Douglas O. Stanley, who lost his life in England on 26 October 1940; the other donated later by Mr A.H. Scherer in memory of Private Scherer himself, who was killed in action in Italy on 10 April 1945. Ref: Bruce Ringer, Memorial seat near HMS Achilles memorial, 2014. The memorial as a whole was restored and upgraded in time for the 70th anniversary of the Battle of the River Plate in 2009. Another plaque was added commemorating the four naval ratings who had lost their lives during the battle: Ordinary Seaman Ian W. Grant; Ordinary Telegraphist Neville J. Milburn, Able Seaman Archie C.H. Shaw, and Telegraphist Frank Stennett. The redevelopment also included the installation of a new ship’s mast and the erection of three totara pou whenua on the boardwalk platform to acknowledge the Māori heritage of the site. Ref: Bruce Ringer, Threepou whenua, HMS Achilles memorial, 2014. The HMS Achilles memorial is accessed via Cliff Road and Springcombe Drive, St Heliers. More photographs can be found on the NZ Memorials Register.